Bombs Away! 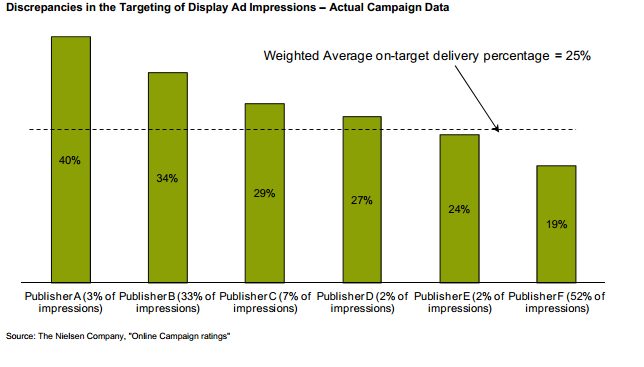 Web Ads Miss Their Target, All the Time. Everyone knows that half of all advertising dollars are wasted. And everyone knows that the Internet fixes that, because digital advertisers can spend money getting their messages to the people they want to reach. Except that’s not true at all: The Web offers advertisers a slew of creepily effective targeting mechanisms, but they only work for some stuff, some of the time. An ad on the Web may do a better job of reaching its audience than, say, a magazine ad. But that doesn’t mean it does a good job. Example: Here’s data from Nielsen, via Bernstein analyst Carlos Kirjner, which tracks the accuracy of a recent ad campaign by “a manufacturer of women’s personal care products.” It was supposed to target women between the ages of 25 and 54. But most often it didn’t — the most accurate publisher got the ads in front of the right people 40 percent of the time. 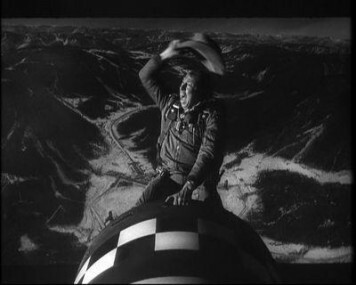 Overall, the campaign only hit the target 25 percent of the time. And nearly half the time — 47 percent — the ads got served to men. Kirjner uses the anecdote to bolster his bullish case for Facebook, which he thinks can do a much better job of targeting than regular sites can, because it knows so much more about its 800 million-plus users. Maybe. I’ve noticed that Facebook has stopped sending me ads that offer to get me a job at the CIA, or to meet Christian singles in my area, so that’s good. Right now, it’s showing me a banner for the McDonald’s Angus Deluxe, which is more accurate, since I do like food. But not that food. The Web’s sorta-close, sorta-not targeting problem hasn’t hampered Google, obviously. But that’s because Google’s search ads respond directly to your input and your intent. Now, Facebook, Google and everyone else are going after the branded ads that dominate TV, where the really big money lives. And if they want to get bigger bites of that, they’re going to have to get more accurate.